Marc Hambidge is owner of Standuppaddleuk.com SUPO emporium based in North Devon. As purveyor of all things SUP, and experienced instructor, we hit Marc up to get the story behind his retail operation. Tell us a little about the Standuppaddleuk’s history – when did you set up shop and why? Standuppaddleuk has been running for only a short while – about a year. I was working as one of the brand managers for Starboard at Tushingham Sails and life on the road was not working out for me and my family. I was putting in a lot of mileage, the work life balance was not balanced. So I decided to leave my fantastic job which was a hard decision believe me – they are a really great company to work for. I live in North Devon and there was at the time no one offering anything retail wise so thought it was the ideal opportunity to set up Standuppadlleuk. How long have you been in your current location and what’s so good about it? What’s your local put in like? Is it flat or more about waves? You would think it was all about the waves – it can be if you want. There are some other fantastic paddles as well though. We have the Taw and Torridge Estuary. Super flat and scenic while there are some great coves and bays to discover like Combe Martin. Is there a better time of year to SUP in your area – if so, when and what makes it good? Great all year round although some of the beaches can get busy in the peak of summer. You can always get a wave to yourself at Wooly (Woolacombe) or Saunton if you’re prepared to walk a little. What gear do you stock and why? 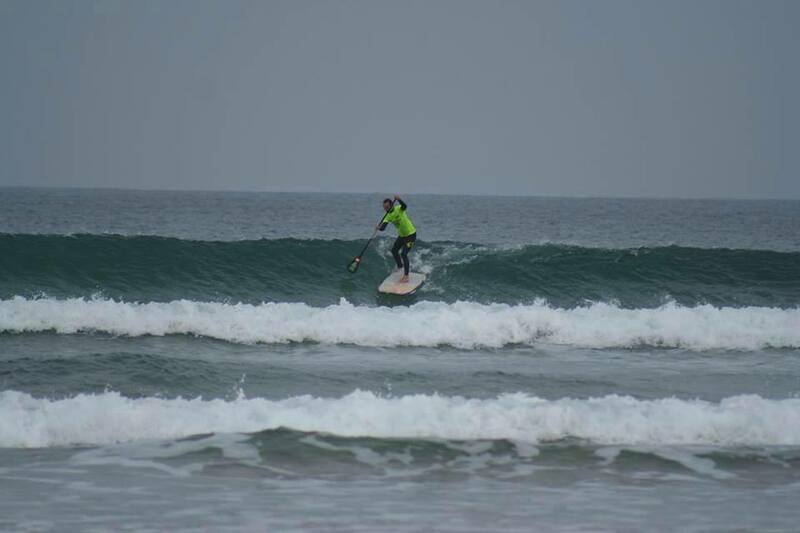 Is Standuppaddleuk all about its regulars or do you attract SUP customers from across the UK? Both really. It’s is hard to compete with the larger outlet’s and there are a lot of retailers out there for the current size of the market. I think a retailer’s local market is key. It’s all about face to face customer service. What are your thoughts about SUP in general – do you see it as a sustainable growth sport? I am not sure the explosion that the industry thought might happen is how it will transpire. North Devon is surfing territory and there has been some resistance to SUP but I think that corner has been turned. We have seen the amount of people on the water double over the past couple of years. I think the growth of the sport in general is more of a slow burner than a fuse on a firework. Talk to us about your own personal paddling experience – what are your aspirations and goals for 2016? I just like to get in the water whenever possible. I always go out with a specific objective to practice. I like to challenge myself and just have some fun. That’s what it’s all about no? I will leave all the competitive aspects to shop/team riders. Got any burning desire to visit any global SUP spots? If so, what’s top of your list and why? Brandon Bay Ireland. I used to work over there for Jamie Knox back in 2004. It’s an amazing location and has some truly epic potentially for SUP surf. It would be nice to have a real pint of Guinness again as it’s been a while. Tell us about the SUP gear you’re currently rocking – what board and paddle combo are you using? Any of the demo boards depending on conditions: Starboard Hypernut, Jimmy Lewis World Wide or the Black & Blue but always with my Werner Rip Stick 79. We know a lot of shops sponsor riders, do you have anyone on the roster? If so, who and why do you support them? I know sponsored riders can be a contentious issue but I think they bring added value if managed correctly. I did a lot of work on this whilst working for Tushingham. I support four riders that might seem a lot but they all bring something different to the sport and are on the water all the time pushing the growth on a grass roots side of SUP. I think this is key to help promote the sport. This coupled with the fact that they are all under the age of 25 shows it’s not all about social economic groups – youth is the future of SUP after all. How do you think Standuppaddleuk contributes to the local SUP scene? A few years ago I set up North Devon and Somerset SUP Club. The aim was to try and bring together the local SUP community – https://www.facebook.com/groups/698628790217222/ It has worked well. If anyone is getting on the water you post on the page to let everyone know what time and where etc. It has helped bring people together. What about other fingers pies – anything happening SUP Mag UK reader should know about? We have been working closely with BSUPA since last October and have helped put together the revived SUP Surf Series 2016. We hosted the first round at Pusborough and will be doing the same for 2017. Last year I was called in last minute to help Alan Cross with the NWF as SUP race director and will be doing the same this year for the 10th Anniversary. It’s lining up to be a blow your socks off event for sure. I’m going to push my coaching going forward – I have been coaching different disciplines, including windsurfing and kayaking, for the past 17 years so it’s something I want to revive. I am also in talks with Rockerline Clothing about a new venture and will update when it’s all confirmed. Any final shouts, thanks or praise? Big up to my Bec, Dylan and Reubyn for putting up with me disappearing onto the water all the time. And Nick Thorn from SUPSouthWest.com, the local school here in North Devon. Flow Wellness https://www.facebook.com/flowwithlife/?fref=ts for all the yoga and massage, helping to keep me on the water.